Caller identification (Caller ID) is a service that allows the receiver of a phone call to determine the identity of the caller. Caller ID is initially sent over at the start of the phone call and identifies the incoming caller before the receiver answers the phone. Caller ID is not associated with the actual phone number but is part of the initial call setup, which allows the caller to manipulate the Caller ID to display a different number from the number that is calling. If you have ever received a call where the caller said that you called them when you have not, then your number was most likely spoofed by another person. There are many phone scams that use Caller ID spoofing to hide their identity because Caller ID spoofing makes it impossible to block the number. Anyone can spoof their outbound Caller ID by using an online service like Spooftel and SpoofCard, which allow anyone willing to pay to spoof numbers. These services are meant to protect the caller’s number from being displayed and claim they aren’t intended for malicious purposes, but they have limited control over who uses the service. Companies can also control their Caller ID if they have their PRI or SIP connection, the technical names for multi-line enterprise telephony setups. Are there multiple victims with Caller ID Spoofing? There are always multiple victims when a scammer uses Caller ID spoofing. The main victim is the receiver that answers the telephone call with a number being spoofed, aka the target of the scam. The secondary victim is the owner of the number; their number is being used without permission. The secondary victim does not even know that their number is being used, and this could have an adverse effect on their business. There are applications and telephone companies that block the secondary victim’s number from making legitimate calls. This could harm law abiding businesses or customers whose numbers have been faked by scammers. A business in West Springfield on June 22, 2018, received about 300 calls in one hour. Due to the high volume of calls, the business did not have enough resources to answer all of the calls. It quickly became apparent that the businesses number had been used in a series of spoofed calls and the calls were not from customers but from the recipients of the spoofed calls. This hurt the business, as they were busy answering calls from people who were not customers. Not only does this cause a monetary loss, but the business’ reputation could have also been impacted as individuals assumed they were using auto-dialers to call people in the area. Is there a way to report Caller ID Spoofing? Many countries do have ways to report Caller ID spoofing. If you live in Canada, you can report the calls to the CRTC and the perpetrator can be fined up to $15,000 per violation. If you would like to report calls to the CRTC, you can navigate to their website and follow the instructions on how to report the call. In the United States, you can report fraudulent calls to the FCC. The FCC will impose a fine anyone that is illegally spoofing a number up to $10,000 per violation. If you suspect that someone is spoofing a number illegally, report it to the FCC. If you do not live in either of these countries and you would like to report Caller ID spoofing, a quick Google search should reveal which organization is responsible for investigating into these types of calls. You can then file a report with them. Increase cognitive and analytical skills. Exhaustive content. Over 300 pages of curriculum aligned content. Interactive and colourful worksheets ensure child is engaged on a non-electronic platform. The state is hit by its worst flood in nearly 80 years. From August 1 to August 17, Kerala received 170% more rain than normal. Subsequent landslides and overflowing rivers brought the state to a standstill. More than 324 people have lost their lives, 36 are missing and around 6.61 lakh have been living in 3,466 relief camps across the state. NDRF teams along with Army, Navy and coast guards, are involved in massive rescue operations. Thousands were rescued from remote areas of Changannur and Kuttanad, which were hit after Vembanadu Lake and Pampa river overflowed. But there are still many more who remained marooned without food, water and medicines. NDRF has deployed 58 teams (55 are working on ground) for its biggest-ever rescue operation. Meanwhile, Prime Minister Narendra Modi visited the state on Saturday and took an aerial survey of affected areas. He announced Rs. 500 crore for relief aid. Earlier, Union Minister Rajnath Singh had announced Rs. 100 crore for the state. The PM also said Rs. 2 lakh will be given to kin of deceased, and Rs. 50,000 to severely injured from Prime Minister's National Relief Fund (PMNRF). Delhi CM Arvind Kejriwal announced that he will give Rs. 10 crore, and the ministers of the AAP will donate their one month salary for the state. Capt. Amarinder Singh, Manohar Lal Khattar, and Vasundhra Raje gave Rs. 10 crore each for aid. Telangana CM KCR announced Rs. 25 crore. All elected representatives of the Congress will give their one-month salary towards relief efforts. There are other ways to donate too. Do your bit! Coding is opening up a different world to human society. Despite the various uses of coding, it appears tough and foreign to most people. There aren't many good books on coding which a layman can understand. However, with kids showing interest from early ages, games have come up as a fun way to learn to code. Here are the top games which teach coding. CodinGame runs on a browser application. It is mostly targeted to intermediary and advanced coders. The game provides puzzles and challenges that have to be solved by writing code. As the levels progress, the challenges increase in difficulty. It supports over 25 coding languages including PHP and Python. The challenges, like programming turrets to shoot airships, make it a fun experience. Code Hunt is one of the best games for people setting out to learn their preferred coding language. The game can help you learn Java or C#. Players pick a language and the game guides them through loops and strings, before moving onto tougher things like puzzles and ciphers. The easiest way to learn the basics of a language is through this game! Players progress through different levels and a fantasy-theme has been added for enjoyment. However, the coders will experience real joy by unleashing their code on opponents. The developers encourage challenges and had a tournament called 'Greed' where the cash-prize was $40,000. They also help companies recruit high-level coders, so playing this can actually get you hired! Upon release, SpaceChem was hailed as one of the best indie games of the year. The game is simple, players have to construct molecules out of atoms and information-blurbs on those molecules appear. The combination requires programming and players have to use techniques like in-order execution, loops, branching, subroutines, and synchronization primitives. A great game for beginner and intermediary coders in a comprehensible environment. RoboZZle is an excellent game for adults and children. It is a puzzle and players have to direct their robot through a maze using limited commands. It sounds like an easy job at the beginning. This part of the game is targeted at the kids. However, as the game progresses, the levels become difficult and leaves seasoned programmers confused. Additionally, a number of changes have also been made with regard to ITR forms and other rules. So, do keep track of the new deadline and these rules before filing your ITR. A number of changes have been introduced in ITR forms, such as in Sections 234F and 234A. To begin with, previously saved but un-filed offline excel/java utility forms will be now be considered invalid. Similarly, in case of online ITR-1, previously saved drafts that weren't filed before July 31 will no longer be available, and a new form will have to be filled from scratch. A verification is required to be done by the applicant while filing ITRs in online and offline modes, under the section 'Taxes Paid & Verification'. Notably, after the due date extension, a new option has been introduced under which one can file ITR either as 'Self' or as a 'Representative'. Furthermore, in case of ITR-4, four options are given - Self, Representative, Karta, Partner. Earlier, rules stated that if a taxpayer failed to file their ITR before July 31, a late fee of Rs. 5,000 (extendable upto Rs. 10,000) was to be levied. However, now, since the ITR filing date has been extended to August 31, this late fee will be applicable in case a person doesn't file their return before the new due date i.e. August 31. In case a taxpayer fails to file their ITR before the stipulated deadline, a monthly interest of 1% will be levied on tax liability, if any, starting from the due date to the actual date of filing. Therefore, since the deadline has been pushed back by a month, interest will be chargeable beginning August 31. 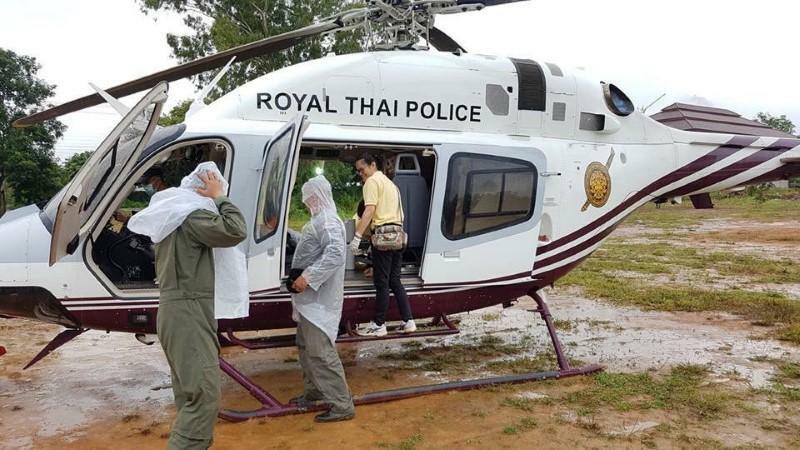 CHIANG RAI, Thailand (Reuters) - A tenth person was rescued on Tuesday from a flooded Thai cave complex where 12 boys and their soccer coach were trapped for more than two weeks, raising hopes all 13 would be out by the end of the day. People across Thailand, and the world, have cheered the rescue operation, including at the Mae Sai Prasitsart school where six of the trapped boys are students.Four more of the boys were carried on stretchers out of the labyrinthine Tham Luang cave on the Myanmar border at dusk on Monday, bringing to eight the number brought out after two rescue pushes on successive days. It’s two weeks ago now since it all began. The boys, aged 11 to 16, rode their bikes down to the cave and spent 700 baht ($28) at the local shop, buying food, soft drink and sweets. Family members raised the alarm later that day. Where were they? Their parents’ concern drove their coach 25-year-old Ekapol Jantawong, a stateless orphan who shared their love of football, to the cave. Near the entrance, he found their bikes, a discovery that meant he had to go deep inside to try to locate them and bring them back.